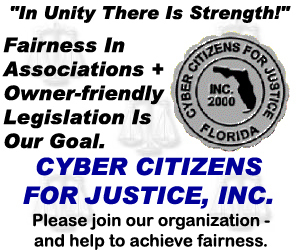 When CCFJ succeeded in pushing H7119 through the Florida Legislature in 2013 it closed one serious loophole in the HOA election provisions. This important sentence was added to FS 720.306(9)(a) …. provided, however, that if the election process allows candidates to be nominated in advance of the meeting, the association is not required to allow nominations at the meeting. An election is not required unless more candidates are nominated than vacancies exist. In former times sitting board members just stayed in power by default – just because there was no quorum of 30% of the voting interest (or less if allowed by the community’s governing docs) at the meeting – in person or by proxy. This new provision allows nominations in advance of the meeting – and no quorum is needed to seat the candidates on the board if there are no more candidates than open seats. And even if there was no election the prior year due to lack of quorum, the candidates have to file again for the next election. See: Romano, Rosenman v. Emerald Preserve-Sumerlin Homeowners Association, Inc. So-called hold-over candidates don’t get automatically a 2-year term. Just look at the case of TURNER vs. BUTLER FARMS HOMEOWNERS ASSOCIATION, INC., (+ CLARIFICATION) combined with the ROMANO, ROSENMAN v. EMERALD PRESERVE-SUMERLIN HOMEOWNERS ASSOCIATION, INC. ruling and you know why one candidate won the whole election and has the right to appoint the complete board. It normally ends bad if association attorney and community association manager ignore existing laws. Admittedly, HOA election provisions are difficult to understand, but we are working hard in Tallahassee to improve the nonsense initially created. FAIR ELECTIONS ARE THE BASIS OF DEMOCRACY. How much longer do we have to say: If entering a community association you are leaving the AMERICAN ZONE.